Come wind or high water! After a terrible storm with lightning and ferocious winds that started in the wee hours of the morning this past Sunday, September 13, the skies opened for the prize ceremony and closing of the 12th edition of the Monaco Classic Week (MCW). Almost a thousand participants in 115 vessels, be it sailing yachts, motor-yachts, powerboats, Rivas and classic rowing skiffs left the Yacht Club of Monaco with enchanting memories and promising to return on September 13-17, 2017. Mark your calendars! Monaco Classic Week (MCW) is a unparalleled event gathering combative sailors, speed fans, proponents of the value of legacy and tradition, owners of elegant motor-yachts, and those who love to venture in rough seas. 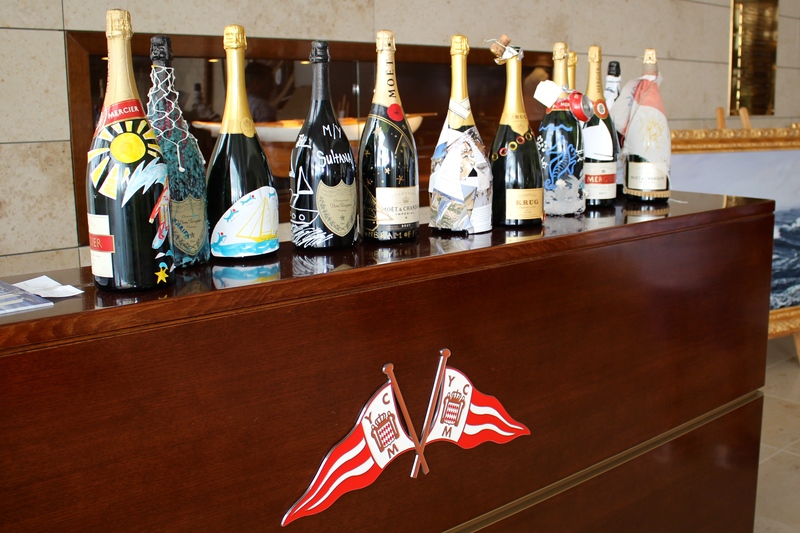 It was a week celebrating life at sea, alternating nautical events with culinary, artistic and elegance contests. The village located on the Hirondelle Quay, in the heart of the YCM Marina, facing the magnificent yachts participating in the MCW, was open everyday to the public with a variety of exhibitors naval shipyards, marine artisans, painters, photographers, sculptors and more. The inauguration Cocktail took place on Quai Louis II outside the YCM flanked by the classic vessels. 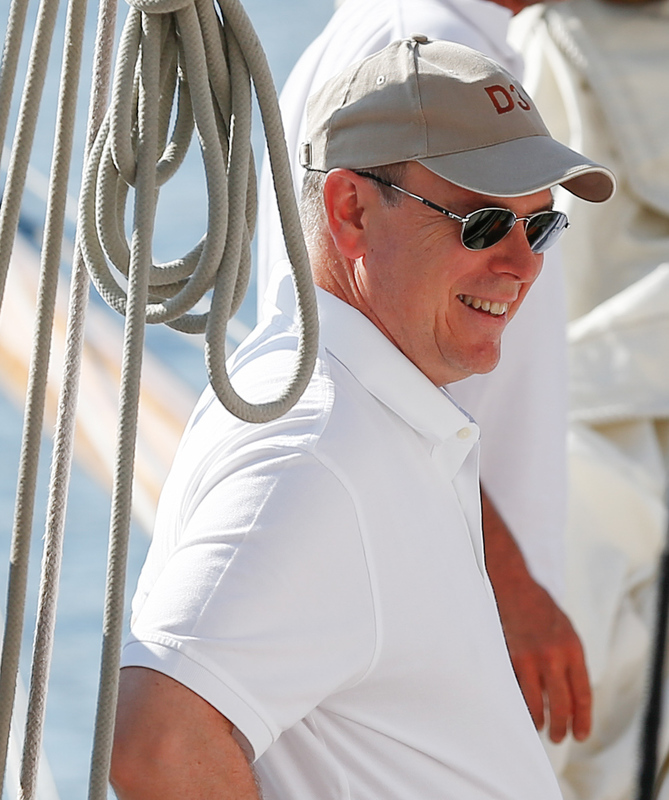 This year the sailing yacht Partridge came to Monaco to celebrate its 130th anniversary, and Prince Albert, President of the YCM since 1984, honored this grand dame of the seas and came to celebrate onboard. Partridge was built by Camper & Nicholson back in 1885, it arrived to the Mediterranean in 1999 and never left. Based in Ciotat, this beautiful fore-and-after cutter of 15 m participates regularly in the classic regattas catching everybody’s attention with its unusual lines, directly inspired from pilot boats from English ports, because at that time that type of style did not exist in the regatta boats. Catherine Chabaud was present at the Monaco Classic Week to raise awareness among all those present of actions taken for the environment with the “Ocean-climate” flag. 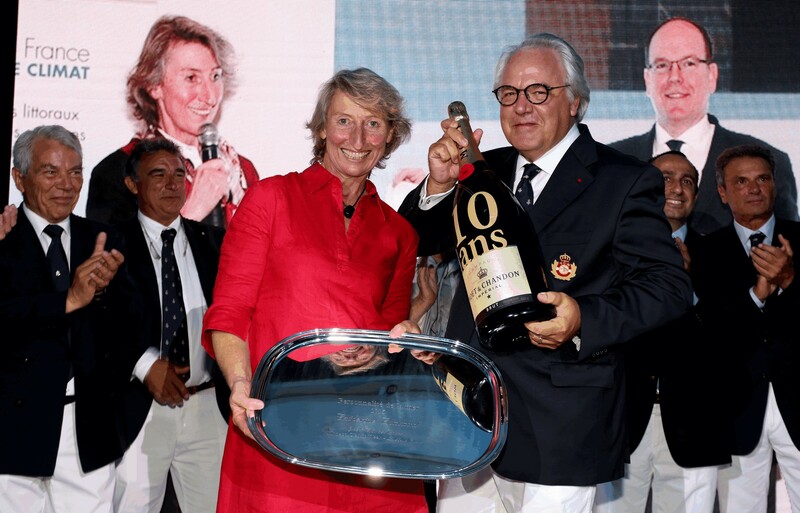 The famous journalist and navigator was clearly surprised when she received the coveted Personality of the Sea 2015 award by Bernard d’Alessandri, General Secretary of the YCM and jury member Patrick Poivre d’Arvor, and in front of a such a large crowd. First woman to complete the solo non-stop round the world during the third edition of Vendée Globe 1996/1997, Catherine Chabaud is very involved in the protection of the environment and will be participating in this December’s COP21 Climate Conference being organised by the French government: “This is an issue for governments of course but also for all of us. We all have in common the fact that the oceans are our future, and it is imperative the voice of the ocean is heard in Paris 2015,” she said. 2009 : Mike Horn . The chefs’ gastronomic competition took place on Thursday, September 10 and it was a huge triumph not only among the chefs on board, but also the public who were able to have a look at the dishes displayed on the quay before the jury’s deliberations. The presence Adriana Karembeu sitting alongside the Jury, which included Christian Plumail (YCM), Christian Garcia (Prince’s Palace) and Paolo Sari (Monte-Carlo Beach), probably explained the sudden enthusiasm for cuisine! A trio of sailing yachts dominated the podium with Rowdy first, Elena second and the Italian sailing school vessel, Corsaro II in third, and last but not least Simon White-Law on Sultana rescuing the honor of the motor-yachts conquering a fourth position. Parallel to the gourmet contest there was one of Magnum’s paintings that unveiled the creativity of the participants. 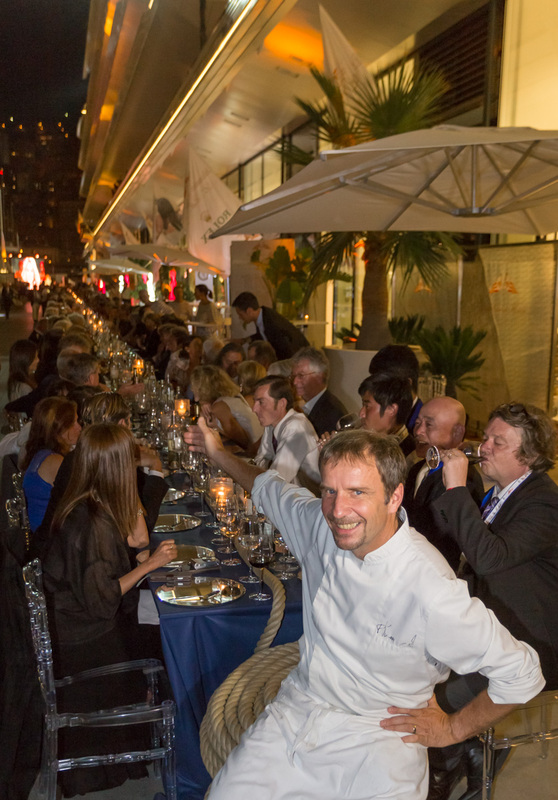 Monaco’s reputation for glamorous partying did the rest resulting in a highly successful few days, for example a long table stretching the length of the quay for 450 guests who enjoyed a giant bouillabaisse – a tour de force by the Yacht Club de Monaco’s Chef Christian Plumail. 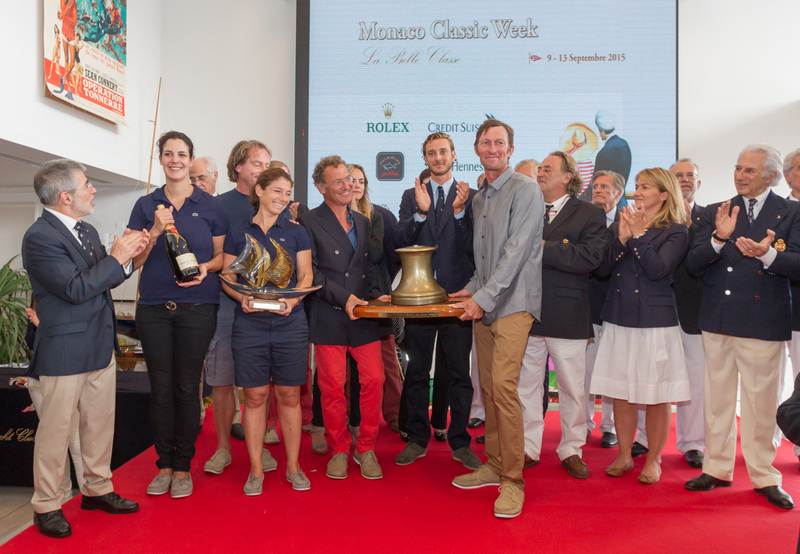 The big winner of this edition was the sailing yacht Morwenna who received the Monaco Classic Week Trophy 2015 from Pierre Casiraghi, Vice-President of the Yacht Club de Monaco, flanked by Allegra Gucci and Jury members. Morwenna also won one of the most coveted prizes at Monaco Classic Week, the La Belle Classe Restoration prize for all classes, well-deserved recognition for the Guip boatyard. In 2013, the Brest-based yard totally restored this English schooner launched in 1914 by Stowe & Sons of Shoreham in West Sussex from plans by Linton Hope, famous for having designed military boats for the MacDonald Nile expedition to Sudan. Another prize coveted by owners and crews, the Concours d’élégance, presided by Princess Beatriz de Orleans, was won by Patna. Restored by her owner Greg Powlesland, renowned for his meticulous restoration of the 1892 Nicholson design, Marigold, Patna is another by Nicholson from 1920 who according to her co-owner Katie Fontana was the pride of the East Coast of England. Patna is back to her original design as a gaff yawl and since 2014 is also the proud owner of a clinker-built annexe built by Greg. She has been sailing in the Mediterranean and was participating for the first time in Monaco Classic Week. The vintage gaff rig class brings together the ancient boats which command respect for their builders and current owners who keep them sailing at the price of meticulous restorations. In the 15m IR class, Tuiga triumphed in Palma but it was Mariska who dominated in Monaco, winning four of the five races held. Two stages to go in this annual trophy for the 15M IR class set up by the Association of owners – two opportunities left to dethrone Mariska, trophy holder for the last two years so there is everything to play for! Elena of London, the faithful replica launched in 2009 of American designer Nathanael Herreshoff’s 1916 schooner won the Big Boat category for vessels over 23m, at 55m (LOA) she proved unbeatable. In the Vintage Gaff category, Olympian (1914) beat Chinook a New York 40 from this one-design class designed by Nathanael Herreshoff, and Eva, a 13.5m Marconi-gaff rig, design n°505 of William Fife III. In the Vintage Marconi category, victory went to the 1937 Olin Stephens design Manitou, once John F. Kennedy’s presidential yacht. The ketch made life difficult for Rowdy who came second, with third place going to Carron II, a newcomer to the Principality. This lovely 8M IR launched by the Clyde yard in 1935 was restored by Fairlie Restorations in Southampton. In the “classic” classes we find boats that were at the forefront of modern trends when launched, most of them designed by the great naval architects of the day for owners who were experienced enough to take the helm for races. Winner this week was Stiren, an “admirable yacht” and typical of the boats designed by Olin Stephens for offshore racing. For her first participation in Monaco Classic Week, Stiren won the category ahead of Il Moro di Venezia, a Frers design launched in 1975 for Raul Gardini, and Bufeo Blanco, a Cesare Sangermani design launched in 1963 which after a total restoration in Viareggio in 2006/2007 returned to the race circuit and now monopolizes the podiums. Below are some photos I took while watching the regattas during Monaco Classic Week. Sublime! Congratulations for your sailing pictures ! They are just amazing ! And it is not easy to have the right composition : congratulations !